best rated online survey sites for USA by user reviews. All sites are completely free to join. Refer here to the USA top rated survey sites, by reward list to find panels ranked by reward type. Participate in paid surveys, online communities, online and in-person focus groups, and app and game testing. Choose between Amazon gift cards or payment checks in exchange for your participation. Most activities are worth at least $1.00 USD, with active members typically earning $10 - $15 (10,000 - 15,000 points) per month. 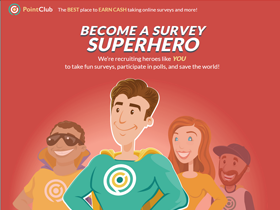 Get up to $5.00 for joining; simply join, confirm your email and take a short profiling survey to get the full $5.00 account credit. 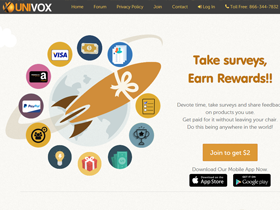 Take fun online surveys for cash paid by PayPal, or choose from over 80 gift card options! If you get screened out of a survey, you'll still get points for your efforts. Join and automatically get 200 points ($2.00) deposited into your account! 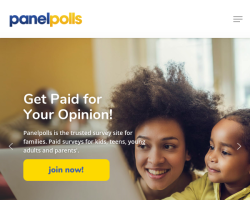 Take surveys for cash paid to your PayPal account, Amazon e-gift cards, Tango cards, or choose Mastercard pre-paid cards. Univox Community is making huge strides in improving and now hosts a website forum as well as holding regular contests which provide additional opportunities to earn points.